PRAIZHOUSE: PRESS RELEASE: #FearlessByTimGodfrey Concert Now FREE To Attend. Register NOW!! 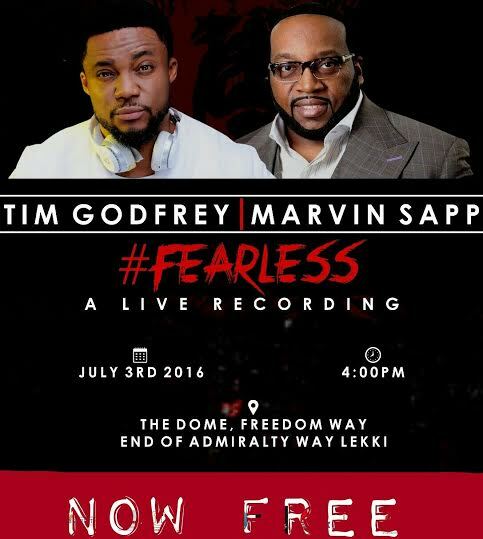 PRESS RELEASE: #FearlessByTimGodfrey Concert Now FREE To Attend. Register NOW!! We are awed by the overwhelming love and support we have received over the past months leading to our album Live Recording themed FEARLESS. We believe that the name of the Lord will be glorified on the 3rd of July and His Kingdom will be advanced even further by reason of your prayers towards the success of the Fearless Concert and live DVD recording. The Leadership of Republic of Xtreme and This present House, are delighted to announce that after much deliberation, the FEARLESS CONCERT will be FREE to all but pre-registration for seat reservation is required. This new development is because tickets have been mopped up by our Sponsors so that everyone who wishes to attend the concert can do so without any limitation or hindrance. We have people coming in from all over Nigeria and the world to be part of this movement and to rob anyone of this opportunity because of their inability to purchase the ticket would be unfair. We are more than glad that every one has an equal opportunity of making History with us and being a part of this Move and wee cannot wait to welcome our friends from around the World. Kindly go to www.timgodfreyworldwide.com to register as there are only limited numbers of seats available. Registration begins today June 24th, 2016 by 6pm. We continue to covet your prayers because our main goal for the FEARLESS Concert is to bring excellence in worship to our God and for the liberation of mankind from fear.